Medium Duty Stretcher Bar By Best: Medium duty pine super stretcher bars are truly that, super bars. The Super Bar is made of pine that has been finger spliced. 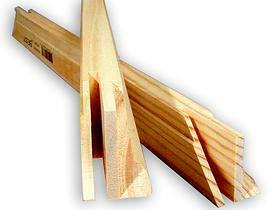 Finger splicing is a method of bonding pieces of lumber together to form a very long straight bar. The spliced joints are actually stronger than the natural wood. The advantage to this method is that we can now get longer, stronger and straighter bars than ever before. First designed for the construction industry, this high tech method is giving better bars than ever before. Sold individually. 1 1/4" in. high. 1 in. thick on flat edge. 1 1/2 in. thick on rolled edge. Sizes range 8" to 96"
The following list is only a sample We can quote and special order most any Size for you you can mix Bars & Braces for quantity price. $10,00 chop charge for custom sizes. Medium- Duty Cross Braces By Best Medium- duty pine super Cross braces are important, Remember that a painting may hang for years, and a long length of lumber can bow. First designed for the construction industry, this high tech method is giving better bars than ever before. Sold individually.
. Sizes range 8" to 144"